Overall, were you satisfied with the service provided by the Cottleville Fire Protection District? Was the 911 dispatch service prompt and courteous? Did the Cottleville Fire District respond in a timely manner? 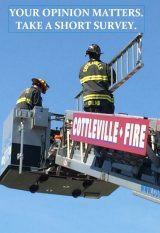 How would you rate the Cottleville firefighters courtesy and concern for your needs?